Self-lubricating, self-contained fluid-film thrust and journal bearings have been in use since the 1920s. 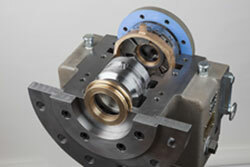 These bearing systems offer relative simplicity in a reliable, stand-alone package. Recent testing has shown that these systems are capable of much more, although history has shown that the workings of the system are largely misunderstood. The purpose of this paper is twofold: one, to explain the proper operation of a self-contained system and how mysterious and repetitive anomalies are easily corrected, and two, present and discuss the experimental results of testing aimed at expanding system applications. Simplicity and functionality in design are common goals of design engineers. With ever increasing emphasis on the bottom line, product improvements that do not increase product cost must also be a goal if a product is to remain both viable and competitive. Plant and reliability engineers are concerned with installation, maintenance and repair costs, as well as the product life cycle. Low total cost and long service life are both desirable features of an enduring product. Self-lubricating, self-contained fluid-film thrust and journal bearings systems are such a product. They offer design simplicity, and used in place of external bearing lubrication skids, provide fewer parts, lower initial and long-term costs. Since they operate as soon as shaft rotation begins, they need no involved starting sequence. In addition, power outages do not affect bearing lubrication during coastdown. An external lubrication system needs to be started before the related machine(s), and requires a backup power source, battery driven pump, or gravity tank to offer lubrication during an emergency shutdown. Therefore, use of the self-lubricating self-contained system means a reduction in machine skid size, weight, complexity, and maintenance. The advantages of these systems are even greater through expanded applications. By refining the design and evaluating system capabilities through test and field applications, self-lubricating, self-contained fluid-film bearing systems appear to have the potential to meet many user requirements.